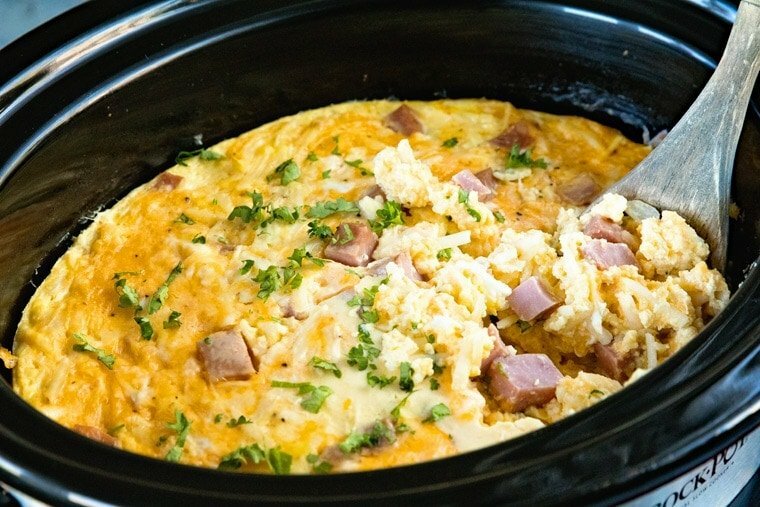 This Cheesy Ham Crock Pot Breakfast Casserole is perfect for an overnight breakfast or easy brunch recipe! 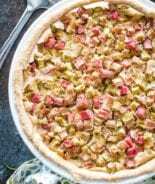 It will make appearances at your holiday brunches, potluck or just because you want a delicious breakfast. It’s perfect for action packaged mornings! It has all your favorites in a breakfast casserole. 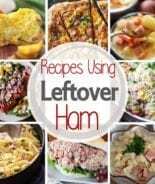 Eggs, hash browns, ham and cheese will make it a star at your table!. 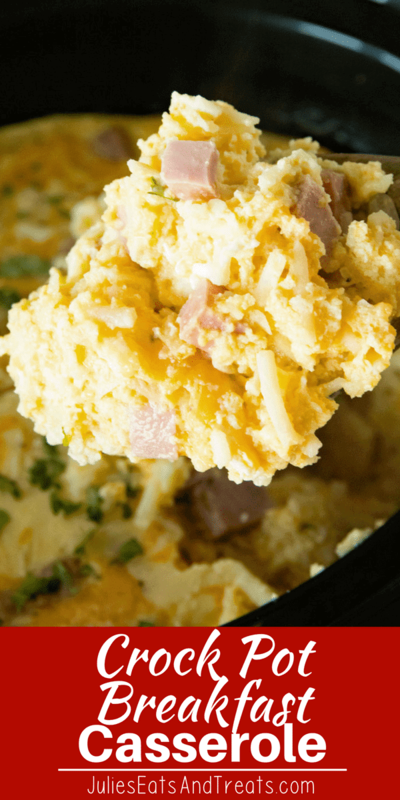 Delicious breakfast casserole layered with hash browns, cheese, eggs and ham cooked in your slow cooker while you are busy doing the other stuff that needs to get done. Sound pretty awesome doesn’t it? 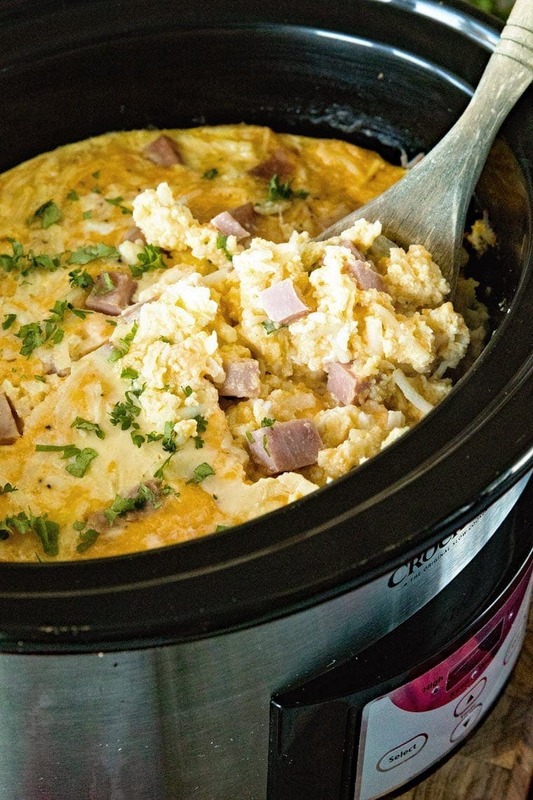 You can either make this crock pot breakfast the night before or make it and cook it the day of. Whatever you choose everyone is going to be sure to love it! I kind of have a thing about breakfasts made in your slow cooker like Turkey Crock Pot Breakfast Casserole, Crock Pot Caramel Apple Rolls, and Crock Pot Peanut Butter Banana Oatmeal. I love that they cook overnight or while I’m doing other things around the house. 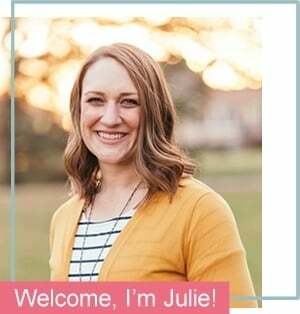 Plus, they are perfect for cooking while you are at church or an activity, then you come home to a wonderful homemade breakfast recipe! A must for me in breakfast casserole is a base of hash browns. Some breakfast casseroles have a base of bread and that’s just not my thing. I love hash browns in my breakfast casserole. 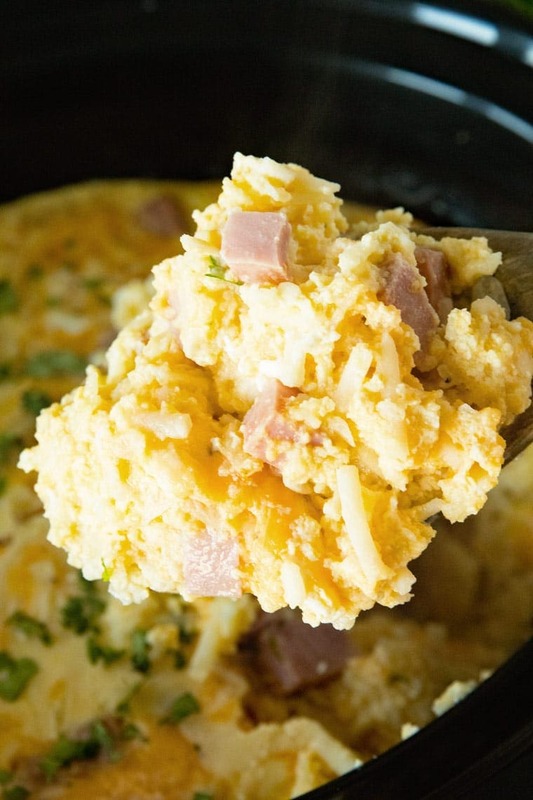 Add in cheese, eggs and ham plus the fact it cooks in a slow cooker and it becomes the best breakfast casserole out there! My family is big on breakfast. In fact I serve it a lot for dinner and referring to it as a “brinner” recipe. I’m not sure why my kids think it’s so exciting to get breakfast for dinner but they do. I like the fact that it provides a few new recipes to rotate on our weekly meal plan. Another great thing about serving breakfast for dinner is the fact that sometimes my husband makes it. He’s really the “breakfast” guy around here. My kids know this and they always go to Daddy when they want a homemade breakfast. I’m also totally ok with giving up the reigns for a meal. 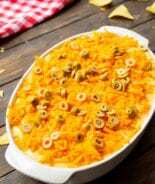 This casserole would make a great meal for “brinner” because you can turn it on and let it cook while you run around to activities with the kids during the after school hours. I’m always making Crock Pot recipes for this reason alone! They are so handy when busy nights are here. Sometimes I forget that breakfast casseroles don’t always have to be for special occasions like Easter, Mother’s Day, Christmas etc. Speaking of Mother’s Day that is totally going to be here before we know it isn’t it? My girls love to bring me breakfast in bed, but this year I’m going to be at a conference and don’t get back in until the afternoon on Mother’s Day. I haven’t had the heart to tell them that yet. #momfail right there! If you are looking for an easy breakfast casserole recipe this one is it! Throw all the ingredients in the Crock Pot and let it do the rest of the work! 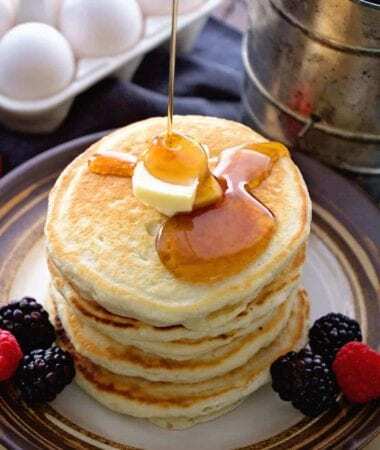 COMPLETE YOUR BREAKFAST WITH THESE RECIPES! 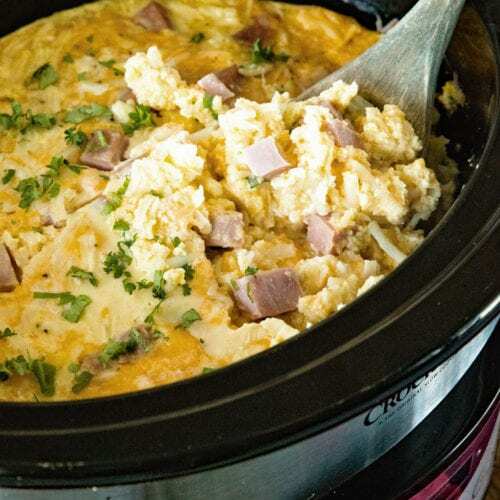 This Cheesy Ham Crock Pot Breakfast Casserole is perfect for an overnight breakfast or easy brunch recipe! It has all your favorites in a breakfast casserole. Eggs, hash browns, ham and cheese will make it a start at your table! In a medium sized bowl whisk together eggs, milk, salt and pepper together. Grease a 5-6 quart slow cooker. Place a third of the hash browns on the bottom, followed by the ham, onion and cheese. Repeat layers twice. Pour egg mixture over the top. 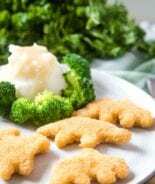 Refrigerate overnight or cook immediately. Cook, covered, on low until set and edges of casserole begin to brown, 4-5 hours. Turn off the slow cooker. Remove insert and let stand, uncovered, 30 minutes before serving. Hi,if i cut the recipe in half,is the cooking time still the same? No it will cook faster. Did you try cutting the recipe in half? What was the cook time? What an amazing dish and hearty to start the day with! I LOVE breakfast casseroles! Never thought to do it in the crock pot before! 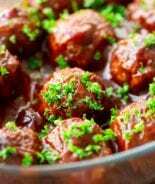 Has anyone tried this recipe cooking it on the warm setting instead of low? If so, what was your cook time? Thank you in advance, I plan on making this on Saturday for a group of people and dont want to dissapoint! The warm setting isn’t safe to cook on due to food borne illness concerns. Made this over the weekend at our seasonal camper to 14 (8 were kids). It was a HUGE hit! Didn’t have fridge space to make ahead of time. Stayed up late and started crockpot at 2:30am on 150 degrees. Unplugged and removed insert to sit at about 9:30am and we ate at 10:15am. It was devoured! When I make it again I will pre-chop the onion and ham in advance. I wonder how this would work in my new instapot that I haven’t used yet?! So glad you enjoyed it! You’d have to put it in a bowl in the IP I think and then do a water bath to come up to pressure. I’m working on an IP breakfast casserole! It will help, but I’ve never tested it like that! Has anyone browned the potatoes first? 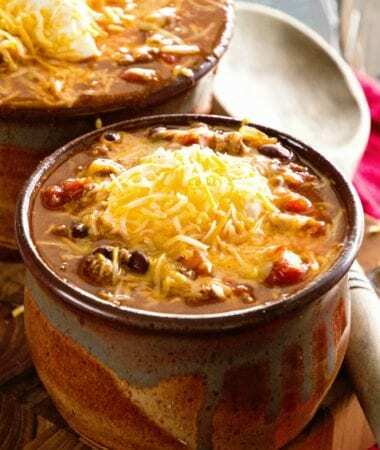 Could this cook on low for 8 hours overnight like other crockpot casseroles?? Perhaps not thawing the hasbrowns ? What if I doubled the recipe? Double the cooking time? I’d just add a couple hours to cooking time I think, but have never tested it like that! The cooker I have is a combination cooker and only has high for the slow cooker setting. Has anyone tried this with adjusted time or would it turn out poorly? TIA! I would adjust cooking time to about half is my best guess. Could you use bread (croutons) instead of hashbrowns? That’s what I have on hand and probably won’t get to the store before I wanted to make this. I think you could but I’ve never tested it like that!